Since 2004 we have been helping artists and small labels release an “acoustic singles” worldwide on a professional music director’s service, plus get a complete tracking report of the airplay. We send your song to Americana, AAA, folk, blues, progressive bluegrass and all roots reporting stations … and hundreds more that do not report to any charts. The Acoustic Rainbow Radio Sampler can help get you a tremendous amount of extra airplay and save you a huge amount of money in the process. WHAT IS THE ACOUSTIC RAINBOW? The Acoustic Rainbow CD Sampler is a co-op venture designed for use by labels and artists to reach acoustic music directors for radio airplay only. Your resources are pooled together to lower costs. The sampler is delivered to over 1,400+ radio shows on over 1,000 stations in North America, England, Australia, Europe, Ireland, Asia and South America who specifically program acoustic music (about 1000 as CD hard copy and 500+ as digital delivery) It is the most cost-effective way available for any acoustic artist to reach this many radio shows, DJ’s, music directors and programmers worldwide with their music. $695 total all-in including the tracking reports … or about 54-cents per station. Why “shotgun” a very expensive package to music directors that simply piles up on their desk unheard? Think of the actual cost: A CD, a bio, press copies, a cover letter and then the postage . . . sending a CD to radio ON YOUR OWN costs almost $6 per station. And then after they get it, after they work their way down the huge pile of albums, after they find the time to review you CD … they will probably play one song. Most artists mail more than 300-400 packages per release with limited results. You can now present your music in an effective manner, have the DJs play it … and send your whole CD specifically to those radio programmers who actually want to use it. Your is song sent on the Acoustic Rainbow CD Sampler to roots DJs worldwide, the airplay is then tracked and reported back to you in about 12 weeks. Cost: $695 complete, no other charges (that’s less than 54 cents per station, including our large international mailing) You can’t even mail letters to these DJs around the world for this price no less send your song on CD ready for airplay plus a TRACKING report! 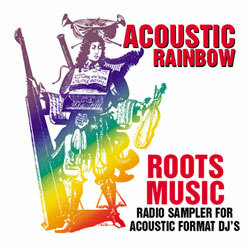 We also send you the entire Acoustic Rainbow database on ready-to-use mailing labels, plus 2 copies of the sampler. If you are truly serious about developing your career and introducing your music to radio, click here to submit your music. First: your song is placed on the Acoustic Rainbow as a single. Second: your full CD is included in the mailing of our next volume. Remember most DJs still prefer the high quality sound and filing benefits of a CD. We will mail your CD to nearly 1000 DJs across North America and around the world. This is the most cost effective way to release your album and introduce your music to radio.